On February 2, the Elijah Interfaith Institute hosted an interreligious forum discussing the significance of the Pope’s forthcoming visit to the Holy Land and the hopes the visit inspires for improved relationships between Christians, Muslims and Jews. The event at the YMCA was held in honour of UN World Interfaith Harmony Week. Rabbi Dr Alon Goshen-Gottstein, founder and executive directors of the Elijah Interfaith Institute, opened the discussion by showing that Pope Francis is not only Time Magazine’s ‘Person of the Year’ – making him a ‘pop star’ – but he is also on the front cover of Rolling Stone – making him ‘not just a pop star, but a rock star’! This enormously popular Pope, is genuinely close to the Jewish people – but is he really able to do more in terms of interreligious reconciliation that his predecessors? The previous two Popes visited the Holy Land. In both cases, their interreligious initiatives failed. Instead of symbolising the hope for healing, the events, at least the aspects of them covered by the media, underscored differences and hostility. This visit does not include an interfaith event – almost certainly because of the previous failures – so how can it provide hope and inspiration for improved interreligious relations? Bishop William Shomali, the auxiliary bishop of the Latin Patriarchate of Jerusalem, is involved in planning the visit of Pope Francis and is aware of the program of his trip – details of which are under embargo. He is full of hope for the visit, even though it will not include a meeting with non-Christian leaders. The biggest hope is the area of ecumenism. When the Pope’s visit was announced, he told Vatican Radio that the community in the Holy Land is “expecting a lot from this visit”. “Christians, Jews and Muslims (in the Holy Land) are counting on this visit to intensify the ecumenical and the interreligious relationships,” he said. He said one of the highlights will be the encounter between Pope Francis and Ecumenical Patriarch Bartholomew, along with all of the bishops and patriarchs of the Holy City. He also expressed the hope that this visit would advance relations with the Orthodox Church. Bishop Shomali reminded the audience that we should not expect immediate results from the visit of the Pope – even though we are in the digital age of immediate results, it would be foolish to expect to see changes from such a visit immediately. There will be a difference but it would be noticeable over time. Pope Francis has said that his prime aim is to commemorate the 50th anniversary of the historic meeting in Jerusalem between Pope Paul VI and the then spiritual leader of the world’s Orthodox Christians, Ecumenical Patriarch Atengora. Catholics and Orthodox have been divided since the Great Schism of 1054, precipitated largely by disagreements over the primacy of the Pope. Pope Francis will be joined in Jerusalem by the current ecumenical patriarch, Bartholomew, who became the first ecumenical leader to attend a papal installation since the schism when he travelled to Rome for Francis’ inaugural Mass in March. In fact, the initiative for the visit was Bartholomew’s. They will celebrate Mass together at the Church of the Holy Sepulchre, where the faithful believe Jesus was crucified and buried. Bishop Shomali believes that even though this will be a very short visit, every moment will count and people will be moved. He said that one of his hopes from the visit is that there will be steps towards the synchronising of the date of Easter, currently a major point of division between the churches. Rabbi David Rosen, International Director of Interreligious Affairs of AJC and its Heilbrunn Institute for International Interreligious Understanding, received a papal Knighthood in 2005 for his contribution to Jewish-Catholic reconciliation. David contextualised the upcoming visit in the framework of Jewish-Christian relations, making the point that all the statements and moves the current Pope has made regarding interreligious reconciliation were already made by his predecessors. The difference is that Pope Francis is loved by the media – and says things in simple language that is easily understood and accepted by the population at large. Rabbi Rosen has a particular admiration for the many positive moves the previous Pope made regarding relations with non-Catholics. However, the press did not pick up on them. 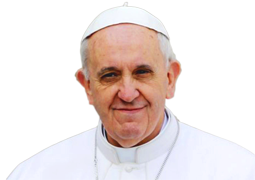 It is Francis who has the charisma – both in the traditional religious sense and in the vernacular use. ‘God always forgives; humans sometimes forgive; nature never forgives’. This, his predecessors have said in documents using complicated theological language. Rabbi Rosen said that precisely because of the brilliance of the Pope in capturing the popular imagination, it is a great shame that this trip is so short and with so few opportunities for meeting the public and with no opportunities for meetings with other religious leaders. This trip will be positive – but it could be so much more positive. The Rabbi is certain that the public will be inspired and uplifted – despite the elements that will be missing. 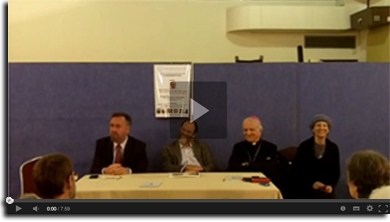 The discussion from the audience indicated that both the Bishop and the Rabbis had correctly estimated the affection for the Pope and the hopes people had for a positive outcome from his visit to the Holy Land. Only one ‘negative’ was expressed – the concern that local Roman Catholics would not have an opportunity to celebrate mass with the leader of their religion. The limited nature of the trip is likely to disappointed large numbers of local Catholics who would like to see the Pope close up. 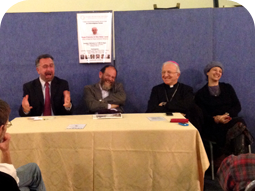 In response to a question about antisemitism in the ranks of the Church, both speakers agreed that all the efforts of the Catholic Church since Nostra Aetate may still not be enough to eliminate antisemitism in every place. Nevertheless, the Catholic Church has had a genuine revolution – David Rosen suggests the most radical change of ideology in any time in history – and Jews are no longer blamed for the death of Jesus. Judaism is an ‘older brother’ or ‘parent’ to Christianity. Jesus was unequivocally a Jew – an observant Jew. The Pope’s visit can highlight that unique relationship between these religions. There was much discussion about the value of symbolism and the fine line between symbolism and substance. Bishop Shomali asked that Israel announce some family reunion visas to Christians to coincide with the visit. The question was raised as to what local Christians and Muslims might do to show their commitment to the spirit of cooperation that the visit would be symbolising. Rabbi Rosen was concerned that timed gestures should not replace an ongoing commitment to behaving morally and dealing with issues of justice. David’s wife and an activist in her own right, Sharon Rosen, reminded the gathering that the visit of the Pope occurs three weeks after the current round of peace negotiations is supposed to conclude. She raised the hope that the visit would cement some real progress and suggested there are items in the embargoed program that could relate to peace efforts. 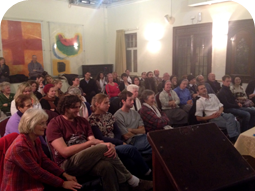 Alon Goshen-Gottstein concluded the evening by speaking of his (and Elijah’s) hopes for the visit. Alon shared the vision of the Centre of HOPE (House of Prayer and Education), where people of all religions will be able to stand side-by-side in prayer, each praying in her own way, and will be able to learn from and about each other. 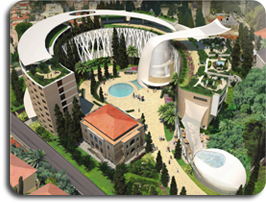 This vision for Jerusalem, ‘My House will be a House of Prayer for all people’, is fulfilment of the vision of the Prophet Isaiah. Alon wants the Pope to endorse and launch this project. He suggested that this would not take any time from the rushed schedule of the Pope. It could happen between the Western Wall and the Temple Mount – because even the charismatic Pope needs to go from one place to another and cannot just ‘materialise’ there! It could be a simple, symbolic, photo opportunity. The symbolism would be substance – the Pope would be endorsing this initiative and in doing so would give real hope for a positive change in the relationships between the people of the three faiths who share the Holy Land. The forum was chaired by Elijah’s Director of Educational Activities, Peta Jones Pellach. 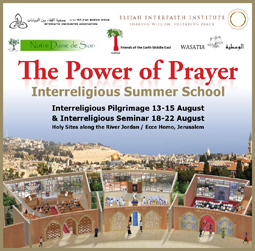 Registrations for the Elijah Interreligious Summer School, both the pilgrimage and the seminar, are now open. Numbers are limited, so advance booking is recommended. 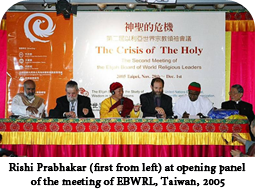 We are sad to announce that Shri Rishi Prabhakar, a member of the Board of World Religious Leaders, passed away on 16th February, 2014. Rishi Prabhakar was part of the work of the Elijah Board since its foundation, in Seville in 2003. A social activist and meditation teacher, he worked ceaselessly for the improvement of society and for taking a moral stand on global issues. He repeatedly invited members of the Elijah Board of Religious Leaders to speak up on a variety of issues. It is striking how he cared about the Israeli-Palestinian situation and how he offered his services time after time for bringing about peace in the Middle East. Rishi Prabhakar was the founder of the SSY (Siddha Samadhi Yoga) Program. He established a Charitable Trust, the RSVK (Rishi Samskriti Vidya Kendra) for serving society and offering ancient Indian wisdom to suit the modern world. He was also dedicated to protecting the environment. He established the ‘Clean India’ movement and personally cleaned many cities and villages. He was a dedicated follower of Mahatma Gandhi in leading a simple life. Starting his spiritual career as a close associate of Maharishi Mahesh Yogi, in later years he also collaborated with Sri Sri Ravi Shankar, who introduced him to the Elijah Board of World Religious Leaders. Our Sharing Wisdom section is an excerpt from the interreligious forum discussing the forthcoming visit of the Pope, where some important issues were raised.